The Export to Toon Boom window lets you export an animatic as Harmony, Animate 2 or Animate Pro 2 scene files. You can export the entire storyboard project or a selection of scenes. You can export the entire storyboard project or a selection of scenes. When the export is ready, you can open it in the destination software. When you first save this new scene, the exported file will be converted in the proper format depending on the software you used.The following elements of your storyboard will be exported: layers, layer motion and camera moves. Exports your animatic to Animate or Animate Pro. Exports your animatic to Harmony Server or Harmony Stand Alone. Format: Select To Database if you are using Harmony Server or Offline for Harmony Stand Alone. Version: Depending on the Harmony version you have, select either 7.8 or 9.2 or higher. 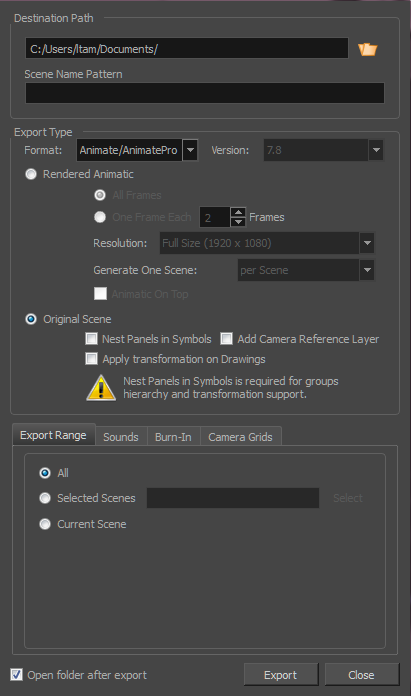 Exports a storyboard to be rendered in bitmap images and exports to Animate/Animate Pro/Harmony scene. For each scene in your storyboard, an Animate/Animate Pro/Harmony scene will be created. Use this option if you have 3D content and want to export to Animate, Animate Pro, or Harmony 9.2 and earlier. And also to export to Harmony if you have bitmap drawing layers. All Frames: Renders the full storyboard project. One Frame Each: Renders only one frame for every chosen number of frames you specify. For example, if you choose to render every 5 frames, then a new image will appear every fifth frame, with each image being held for 5 frames to maintain the timing. Resolution: Lets you select the render size of the project: Full size, half size or quarter size. Generate One Scene: Generates a scene by scene or by selected sequences and panels. Exports the storyboard in a project where the vector drawings, layers and camera settings are kept as is. For each shot or scene in your storyboard, a Harmony/Animate scene is created. Keeps and uses all original sound files. Creates one audio file per soundtrack.